Machine learning and big data analytics are the latest spotlights with all the glare of fame ranging from media coverage to booming start-up companies to eye-catching merges and acquisitions. On the contrary, the $336 billion industry of semiconductor was seen as an “old-fashioned” business, with fading interests from the best and brightest among young graduates and engineers. 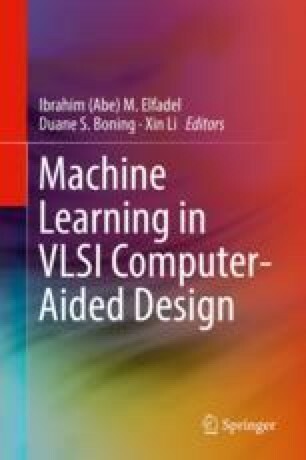 This chapter argues that this does not have to be that way because many research problems and solutions as studied in the semiconductor industry are in fact closely related to these machine learning and big data problems. To illustrate this point, we discuss a number of practical but challenging problems arising from semiconductor manufacturing process in this chapter. We first show how machine learning techniques, especially those regression-related problems, often under the “disguise” of optimization problems, have been used frequently (often with nontrivial modeling skills and mathematical sophistications) to solve the semiconductor problems. We discuss such examples as process variation modeling and VLSI chip testing. For some other types of semiconductor problems, such as manufacturing process monitoring and improvement, we show that some existing machine learning algorithms are not necessarily well positioned to solve them, and novel machine learning techniques involving temporal, structural, and hierarchical properties need to be further developed. In either scenario, we convey the message that machine learning and existing semiconductor industry researches are closely related, and researchers often contribute to and benefit from each other.